We will be offering BOTH Large School and Small School preparation. To register, email director@amcentex.org for the password and link to register online. 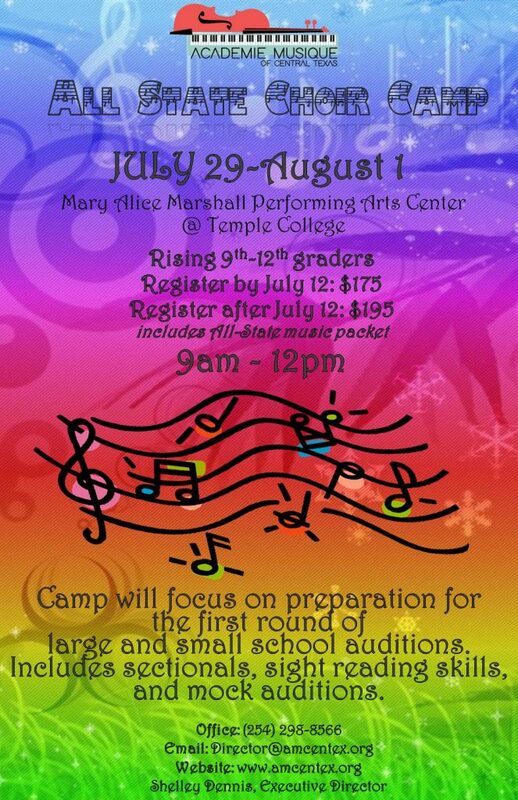 Registration opens May 1st When you register, please specify which division (Large or Small) and voice part you will be auditioning (S1, S2, A1, A2, T1, T2, B1, B2). If the student already has the music packet $20 will be reduced on their tuition. Scholarships are available for past All-State Choir members and for groups of 5 students or more registering. Contact Shelley Dennis at director@amcentex.org for those details. Monday – Thursday, 3:30 – 6 p.m. Copyright Academie Musique | All Rights Reserved | Privacy | Website: Concentus Media, Inc.